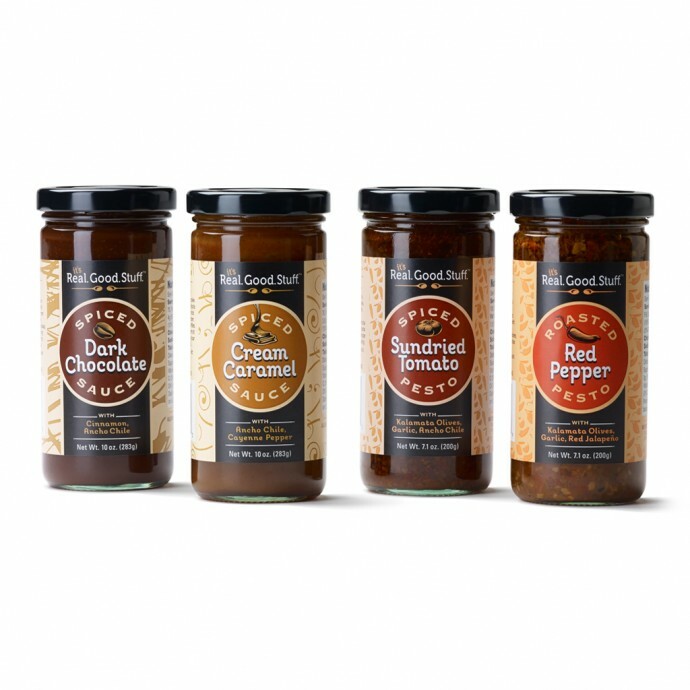 Spiced Dark Chocolate Sauce with Cinnamon and Ancho Chile; Spiced Cream Caramel Sauce with Ancho Chile and Cayenne Pepper; Spiced Sun Dried Tomato Pesto with Kalamata Olives, Garlic and Ancho Chile; Roasted Red Pepper Pesto with Kalamata Olives, Garlic and Red Jalapeño. Sound delicious? You bet they are! it’sReal.Good.Stuff. looked to WhitfieldBarrett to cook up a way to turn product attributes and key brand characteristics into a marketable persona to launch their specialty sauces & kitchen compliments product line. “Food that sticks to your soul.” is the brand positioning we developed to engage customers and ensure them of a great it’sReal.Good.Stuff. product experience. It’s also the strategic recipe that led us to serve up an admired stylized product brand logotype, and classic label design with a modern twist. And for other it’sReal.Good.Stuff. packaging and marketing communications that are simmering, we developed some really good brand standards to extend the product line.